Energy efficiency (EE) is an important strategy for China to save energy and reduce energy-related emissions. With significant regional diversities in China, it is important to conduct the EE assessment at the regional level. Usually, the regional EE assessment is applied to 30 regions in Mainland China using the data envelopment analysis (DEA) technique. With the “Belt and Road” strategy initiated by the Chinese government, it is reasonable and necessary to take Hong Kong, Macao, and Taiwan into consideration. However, such data expansion for China’s regional EE assessment using DEA can reverse the relative rankings of some decision-making units, which is called the “rank reversal” phenomenon. 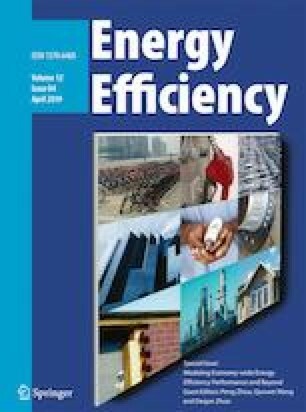 In this paper, we illustrate in theory that rank reversal occurs in general DEA models, and apply the most popular five DEA models to assess China’s regional energy efficiency from 2000 to 2014. The empirical study shows that the 30 regions in Mainland China have the least rank reversal when Tone’s slack-based model (SBMT) is adopted. The main cause of ranking reversal is the addition of decision-making units lying on production frontier. Better understanding of the rank reversal phenomenon is critical for the energy efficiency assessment using DEA to inform the policy makings. The authors thank the financial supports from the National Natural Science Foundation of China (Nos. 71704080, 71774087, and 71573186), the Fundamental Research Funds for the Central University (No. 30917013101), and the Research Foundation of Nanjing University of Science and Technology for the Young Scholars (Grant No. JGQN1703).